A ZIP Code is a postal code used by the United States Postal Service (USPS) in a system it introduced in 1963. The term ZIP is an acronym for Zone Improvement Plan;  it was chosen to suggest that the mail travels more efficiently and quickly ( zipping along) when senders use the code in the postal address. The basic format consists of five digits. An extended ZIP+4 code was introduced in 1983 which includes the five digits of the ZIP Code, followed by a hyphen and four additional digits that reference a more specific location. In 1983, the U.S. 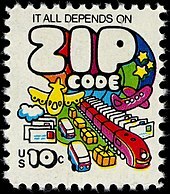 Postal Service introduced an expanded ZIP Code system that it called ZIP+4, often called "plus-four codes", "add-on codes", or "add-ons". A ZIP+4 Code uses the basic five-digit code plus four additional digits to identify a geographic segment within the five-digit delivery area, such as a city block, a group of apartments, an individual high-volume receiver of mail, a post office box, or any other unit that could use an extra identifier to aid in efficient mail sorting and delivery. However, initial attempts to promote universal use of the new format met with public resistance and today the plus-four code is not required. In general, mail is read by a multiline optical character reader (MLOCR) that almost instantly determines the correct ZIP+4 Code from the address—along with the even more specific delivery point—and sprays an Intelligent Mail barcode (IM) on the face of the mail piece that corresponds to 11 digits—nine for the ZIP+4 Code and two for the delivery point. Unique ZIP Codes are used for governmental agencies, universities, businesses, or buildings that receive such extremely high volumes of mail that they need their own ZIP Codes. Government examples include 20505 for the Central Intelligence Agency in Washington, D.C.; 81009 for the Federal Citizen Information Center of the U.S. General Services Administration (GSA)  in Pueblo, Colorado. Examples of private address unique ZIP Codes include the headquarters of Wal-Mart (72716). 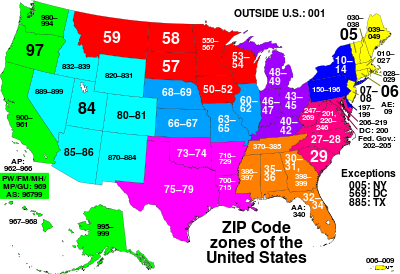 ZIP Codes are numbered with the first digit representing a certain group of U.S. states, the second and third digits together representing a region in that group (or perhaps a large city) and the fourth and fifth digits representing a group of delivery addresses within that region. The main town in a region (if applicable) often gets the first ZIP Codes for that region; afterward, the numerical order often follows the alphabetical order. [ citation needed] Because ZIP Codes are intended for efficient postal delivery, there are unusual cases where a ZIP Code crosses state boundaries, such as a military facility spanning multiple states or remote areas of one state most easily serviced from a bordering state. For example, ZIP Code 42223 serves Fort Campbell, which spans Christian County, Kentucky, and Montgomery County, Tennessee, and ZIP Code 97635 includes portions of Lake County, Oregon, and Modoc County, California. The numbers increase southward along the East Coast, such as 02115 ( Boston), 10001 ( New York City), 19103 ( Philadelphia), 21201 ( Baltimore), 20008 ( Washington, D.C.), 30303 ( Atlanta) and 33130 ( Miami) (these are only examples, as each of these cities contain several ZIP Codes in the same range). From there, the numbers increase heading westward and northward east of the Mississippi River, southward west of the Mississippi River, and northward on the West Coast. For example, 40202 is in Louisville, 50309 in Des Moines, 60601 in Chicago, 63101 in St. Louis, 77036 in Houston, 80202 in Denver, 94111 in San Francisco, 98101 in Seattle, and 99950 in Ketchikan, Alaska (the highest ZIP Code). The second and third digits represent the sectional center facility (SCF) (e.g. 477xx = Vanderburgh County, Indiana), and the fourth and fifth digits represent the area of the city (if in a metropolitan area), or a village/town (outside metro areas), e.g. 47722 (4=Indiana, 77=Vanderburgh County, 22= University of Evansville area). When a sectional center facility's area crosses state lines, that facility is assigned separate three-digit prefixes for the states that it serves. Despite the geographic derivation of most ZIP Codes, the codes themselves do not represent geographic regions; in general, they correspond to address groups or delivery routes. As a consequence, ZIP Code "areas" can overlap, be subsets of each other, or be artificial constructs with no geographic area (such as 095 for mail to the Navy, which is not geographically fixed). In similar fashion, in areas without regular postal routes ( rural route areas) or no mail delivery (undeveloped areas), ZIP Codes are not assigned or are based on sparse delivery routes, and hence the boundary between ZIP Code areas is undefined. For example, some residents in or near Haubstadt, Indiana, which has the ZIP Code 47639, have mailing addresses with 47648, the ZIP Code for neighboring Fort Branch, Indiana, while others living in or near Fort Branch have addresses with 47639. Many rural counties have similar logistical inconsistencies caused by the aforementioned sparse delivery routes, often known as Rural Routes or by some other similar designation. Postal designation confusion may have financial implications for local governments because mail volume is one factor used by the U.S. Census Bureau to estimate population changes between decennial census enumerations. [ citation needed] Sometimes local officials in a community that is not the preferred place name for a ZIP Code but is an acceptable place name will advise residents to always use the name of the community, because if the census estimate of that town's population is low they may receive fewer funds that are computed based on population. A typical example is Paddock Lake, Wisconsin, whose preferred place name is Salem. Paddock Lake is incorporated as a village within the town of Salem, even though there are more people in the village of Paddock Lake than there are in the unincorporated parts of the town of Salem. Further confusion is caused because Silver Lake, Wisconsin, which is also a village in the town of Salem and is of similar size and status to Paddock Lake, has its own ZIP Code and post office. In another case, the U.S. Federal Communications Commission (FCC) denied a radio station (now WNNX FM) a move requiring a change in its city of license to Sandy Springs, Georgia, largely because it was not a city (until municipal incorporation in late 2005), despite being the seventh-largest place in the state by population. The FCC cited the use of " Atlanta" on letters of support from local organizations, even though the USPS forced them to use Atlanta for 30328 until well after incorporation took effect. Currently "Sandy Springs" is only acceptable, despite none of 30328 being in Atlanta, or anywhere else outside the Sandy Springs city limit. This even applies to the ZIP Code used only for PO boxes at the Sandy Springs main post office. Because ZIP Codes and their associated place names can ignore county lines, problems may occur where street addresses are based on quadrant location within a county. For example, the area served by 30339 straddles the Cobb County– Fulton County line in Georgia. The Cobb County portion of this area includes Vinings in the southeast of that county; the Fulton County portion lies within the city limits of Atlanta. Every street address in Vinings is labeled SE, and has a house number on the Cobb County grid (according to the distance from the town square in the county seat of Marietta). However, because the USPS demands the use of Atlanta, Vinings addresses are written such that they appear to be in southeast Atlanta, instead of in the opposite (northwest metro Atlanta) side. As of 2015 [update], there were over 42,000 ZIP Codes in the United States. ZIP Codes are used not only for tracking of mail but also in gathering geographical statistics in the United States. The U.S. Census Bureau calculates approximate boundaries of ZIP Codes areas, which it calls ZIP Code Tabulation Areas (ZCTAs). Statistical census data is then provided for these approximate areas. The geographic data provided for these areas includes the latitude and longitude of the center-point of the ZCTAs. There are approximately 32,000 ZCTAs. The reason that there is not one ZCTA for every ZIP Code is that PO Boxes are excluded, since only populated areas are included in the Census data. The Census Bureau provides many statistical data sets for ZIP Codes, but does not keep up-to-date datasets of all ZCTAs. Complete datasets providing a similar approximate geographic extent are commercially available.